Lighting A Revolution: Ink Blotter 109-7, "Edison's Dream Comes True"
Blotter number 109-7; image number: LAR_B1097. "His Only Rival. 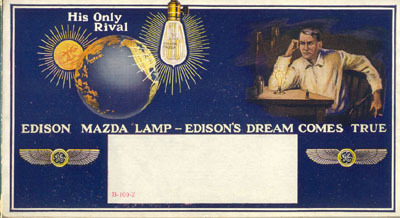 Edison Mazda Lamp  Edison's Dream Comes True." Here the Sun's Rival logo begins to recede and complements the image of a young Thomas Edison deep in thought over his newly invented carbon lamp. This idea of Edison, alone in his genius, recurs often in advertising of this era. The role of "Wizard of Menlo Park" helped Edison raise money for his work and sell the resulting products. This was one reason for establishing the myth of Edison as a lone inventor, even though he had the assistance of many able people. Though Edison all but abandoned work on electric lighting after the early 1890s, GE sold "Edison Mazda" lamps until after his death in 1931. The "dream" refers to Edison's idea of creating a simple and inexpensive source of light. Edison had declared in 1882 at the opening of the Pearl Street Station that "I have accomplished all I promised," with his carbon lamp and central power plant to energize it. 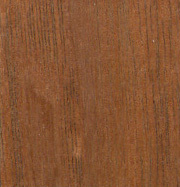 This blotter implies, however, that the realization of his work waited on the development of the second generation tungsten lamp.